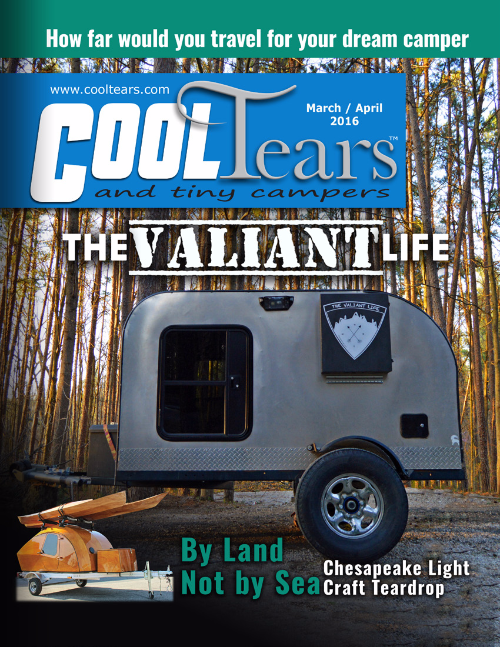 » view the CLC Teardrop Camper materials list and order a la carte! A fan of small boats, small cars, and small houses, designer John C. Harris found the concept of a teardrop camper irresistible. "Think of it as a big step up from a tent in terms of comfort and utility. But it's so compact and light that I could tow it behind my MINI Cooper. Even the smallest 'traditional' RV trailers are going to require at least a mid-sized tow vehicle, and will make a giant dent in your gas mileage." Teardrops have always been available as build-your-own projects. You can find ads for kits and plans in old magazines from the 1930's and 40's. Some of these are pretty sophisticated, but most are clumsily-built, and look and feel cheap. 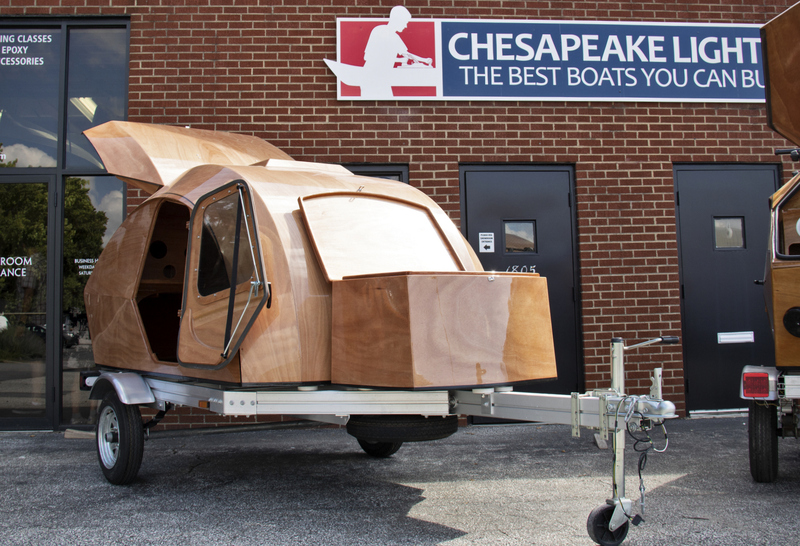 "What if we take the same boatbuilding materials and techniques we've been refining for 25 years at Chesapeake Light Craft and build a teardrop trailer? And the same sculptural approach that we bring to boat design?" Harris asks. The result is the 5' x 8' (1.5 x 2.4m) teardrop you see here, and it's a lot more elegant than the common "canned ham" teardrop designs. Drawn around a 60 x 80" (1.5 x 2m) air mattress, this little camper is small on the outside but surprisingly roomy on the inside. Two adults up to 6'6" (198cm) can stretch out in great luxury. Large doors on both sides and a 15" square hatch on the roof provide easy access and copious ventilation. There's room for a 12-volt electrical system to run lights, fans, a stereo, and charging plugs for devices. A large galley occupies the locker in the rear of the trailer. While this space could be customized in many different ways, staff designer Dillon Majoros has devised a brilliant shelving unit that drops in as a separate module, and which we'll offer as a kit option. For car-camping or tailgating, this will be a giant improvement over a tent. No fooling around setting up a tent: arrive at destination. Park. Open door. Climb in. Go to sleep. We started the project in Fall 2014 and took our time, documenting every step with carefully staged and lit photos and video, on the way to creating an extensively-detailed start-to-finish instruction manual and, eventually, a how-to video. "My dad and I finished mine about 10 days ago, and I think I've spent 5 out of the last 7 nights bunked in it. It's like having a treehouse on wheels," Sheldon writes. "I think people like us are united by the fact that we all still want a whimsical backyard fort from which to launch adventures. Our 'backyard' is just a little bigger now." While a trailer isn't included in the basic kit package, one of the key features of the design is that it will fit on nearly any small trailer. "We started with the cheapest and most basic trailer, a Harbor Freight flatbed that cost $189 delivered," Harris explains. "But the architecture lends itself to fitting on just about anything with wheels. Boat trailers, flatbeds, whatever. Just bolt it down and go." 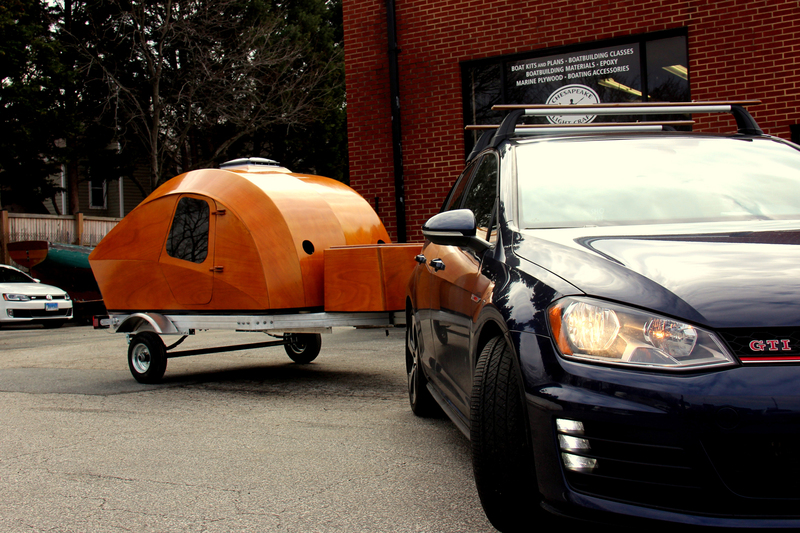 CLC collaborated with Trailex to design a custom ultralight trailer just for the CLC Teardrop Camper (shown). 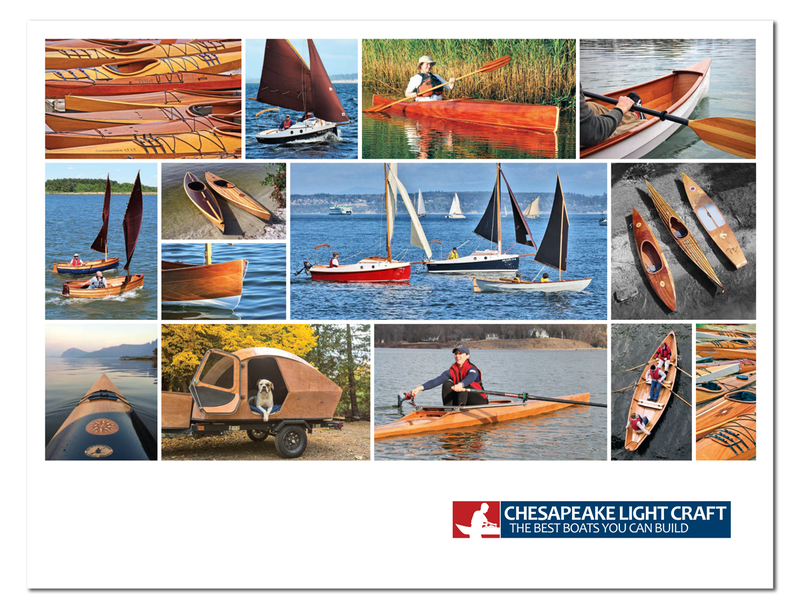 Construction of the CLC Teardrop will be familiar to anyone who's built a stitch-and-glue kayak or small boat. Starting from a kit, computer-cut marine plywood panels are bent into a simple mold (included with the kit). The seams are reinforced with epoxy and fiberglass tape. The teardrop is flipped over, the mold removed, and the streamlined, sculptural shell is sheathed on the exterior with a tough coating of fiberglass for strength and durability. Doors and hatches are cut on marks engraved by the computer cutter. Then lots of sanding, install the galley, and you're done. We finished ours "bright," ie varnished inside and out. It makes a striking statement on the highway, parking lot, and campground. The roof has been reinforced from the start for roof-racks, so you can carry kayaks or bicycles atop the CLC Teardrop. An optional lockable storage box, sized to fit a 48-quart cooler, mounts forward of the camper on the trailer tongue. 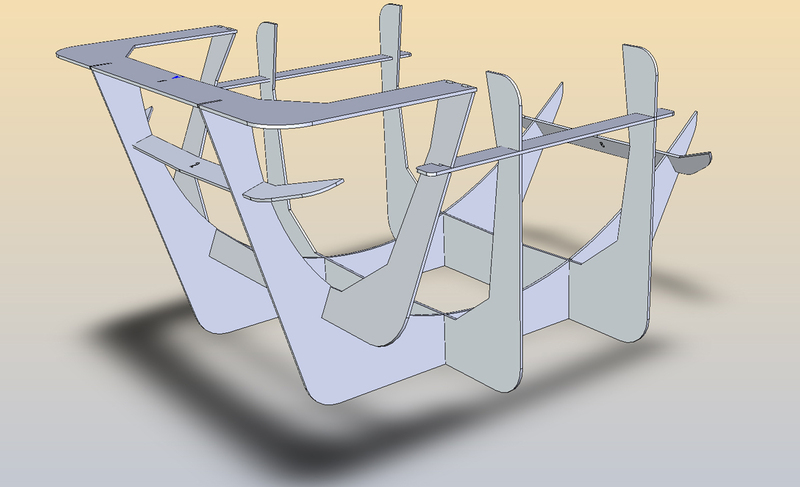 COMING SOON is a 23-cubic foot "Integrated Cargo Carrier" that can hold anything from surfboards to skis to tents. More on the Integrated Cargo Carrier here. We have created a bulletin board specifically for the CLC Teardrop Camper. There, builders can share tips and tricks and photos of their projects. We will also publish technical bulletins there from time to time. Interested in a Finished Teardrop Camper? $2299 for the base kit, plus shipping. Teardrop Camper add-on Modules: The Galley Module, Storage Box, Interior Headliner, and Roof Rack Packages ship separately from the Base Kit. These packages ship via UPS Ground -- shipping rates will be calculated in the shopping cart based on your destination. Ordering a Teardrop Camper is just like ordering any of our boat kits. Click online, check out using our secure online ordering system, and our craftsmen will start making sawdust! Where can I see a completed sample? The Teardrop Camper is on display here at CLC in Annapolis and available for inspection during normal business hours. What is NOT included in the base kit? Also sold separately are the roof hatch (many styles fit), the "mushroom" vents, galley cabinet module, electrical system, interior headliner, roof racks, and tongue storage box. You'll can order these items either concurrently with the base kit, or add them later as desired. Or fabricate or source them yourself. While you'll be supplied with plenty of epoxy to coat and seal the Teardrop Camper, the necessary final finish - varnish and/or paint - is sold separately. The CLC Teardrop Camper is built from high-quality okoume marine plywood in a simple slot-together female mold, stitch-and-glue style. In this system, you assemble pre-fabricated components with temporary wire stitches to form a sturdy, rigid, elegantly-shaped camper shell. The exterior is sheathed in a rugged coating of fiberglass cloth and epoxy, and all surfaces inside and out are sealed with epoxy. This will make the camper absolutely waterproof and give it longevity to rival any fiberglass or aluminum body. Built as directed and given reasonable care, the camper will outlive you. Is construction suitable for first-time builders? Yes. First-timers should probably work from a pre-cut kit, for the accuracy of the joinery this affords. Builders working from plans might want to have built a stitch-and-glue boat or two first. Although the Teardrop Camper is okoume marine plywood and most builders will give their shells a clear finish on the outside (like our display model), there really isn't much woodworking if you start with a kit. To someone unfamiliar with the stitch-and-glue construction technique, it's probably easiest to picture the project as a giant airplane model kit. We've cut out the parts, you assemble them with glue, then sand and finish. There's quite a lot of epoxy and fiberglass work, all intended to make the camper light, strong, and waterproof. Assembly itself goes quickly, while much of the elapsed time will be consumed by sanding and finishing. Will you have video instructions to help with construction? Yes, eventually. You can watch synopsis of construction here. Meanwhile, our friends at Waterlust posted an entertaining and informative series of videos of their Teardrop Camper build; we've devoted a page to their video series. Watch the Waterlust Build Videos Here. How long will it take to build the CLC Teardrop Camper? Feedback from many builders indicates that 250 hours is average. Basic assembly goes very quickly, and most will have the shell complete after a few weeks of evenings and weekends. Coating, sanding, and finishing are straightforward but moderately time-consuming. The fit-out (galley, electrical system, interior liner, and so on) will vary a lot from project to project. Some builders will keep it really simple, others will outfit their teardrops with extravagant electrical systems and galley fittings. That's part of the fun of doing it yourself! A clear space eight feet by ten feet would be the absolute minimum. Ten by twenty would be better. What sort of tools will I need? If you're building from a kit, just common hand tools and a good 5-inch random orbital sander. A pair of sawhorses, a cordless drill, a few dozen spring-clamps. A saber saw. Lots of disposable gloves, disposable brushes, and epoxy mixing cups. A router is nice for some steps but not required. What does the kit itself look like? The Teardrop Camper "Base Kit" ships in 6 boxes. The weights and dimensions of the boxes, as well as the shipping rates across the U.S., can be found further up the page, here. Of course, if you're within driving distance of Annapolis, you can pick up your kit here at the factory. Will you be offering a build-your-own class for the Teardrop Camper? Yes. So far we have had several classes each year since 2017. Read about those classes here. Because of the size and parts-count, this is a two-week class, in contrast to our normal one-week programs. The price is $6373 including the kit, Trailex trailer, and tuition for two. If you find a build-your-own-Teardrop class appealing, please send an email, subject line "Teardrop Class," to info@clcboats.com, and let us know the dates that would work for you. What kind of trailer will I need? The CLC Teardrop Camper has been designed and engineered to fit on anything from a $200 Harbor Freight flatbed to that old boat trailer that's been sitting in your back garden. We have teamed with Trailex to design a lightweight aluminum trailer specifically for the CLC Teardrop Camper, and it will be available as an option. The Trailex trailer costs $1554 or $1657, depending on wheel size, and is shipped directly to your house for assembly. What are the dimensions of the CLC Teardrop Camper? 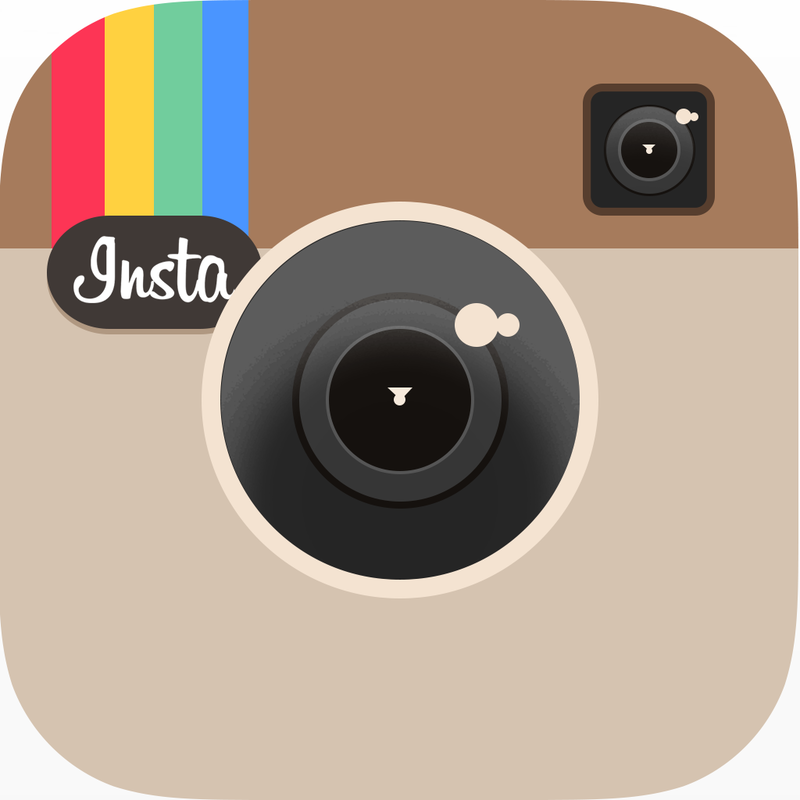 You can link to a high-res drawing, with dimensions in standard and metric units, here. The shell itself measures 96-1/4" long, 65-7/8" wide, and 44-7/8" tall. The actual height off the ground will vary a lot depending on your trailer choice, but expect between 62 and 68 inches. Mounted on the custom Trailex trailer, our demo model is 66-3/8" tall, not including the vent hatch. The interior floor measures 80" x 60", the same as a queen-sized mattress. Headroom is about 44". How much does the CLC Teardrop Camper weigh? About 250 pounds fully outfitted and accessorized. The basic shell and galley weighed 176lbs on our digital scale. Trailer weight will vary wildly; our aluminum Trailex trailer weighs 196lbs. Figure on a total of 500-600lbs all-up with typical outfitting. Is my car big enough to tow the Teardrop Camper? If your car can be fitted with a trailer hitch, it is big enough to tow the CLC Teardrop Camper. The two prototypes built in 2015 are towed by a Honda Fit and a VW Golf GTI. Can I install roof racks on the Teardrop Camper? Absolutely! This functionality was designed in from the start and the roof engineered for the loads. We have installed Thule racks on ours, suitable for a pair of kayaks, or bicycles, etc. The rack towers are high enough to allow the roof hatch to open at least partially when the roof racks are loaded. 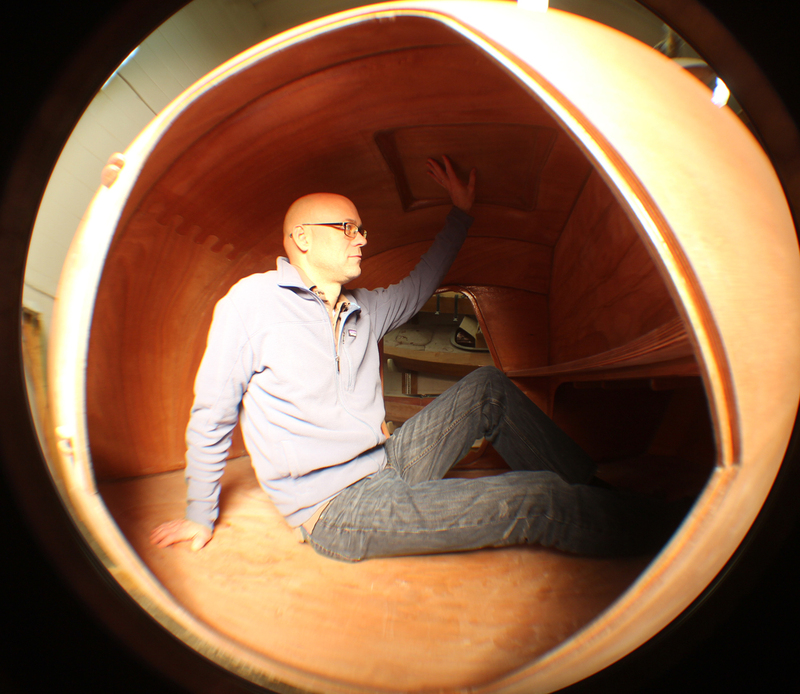 Will I/we actually fit inside the CLC Teardrop Camper? If "yes," then you fit. There's loads of headroom for people up to about 6'5". Hanging out inside on a rainy day is a lot more comfortable than in the typical tent! One option for really hot weather is to carry an inexpensive 10x10 pop-up tent with screened sides. This could be set up over the 6'x8' Teardrop Camper in minutes, allowing you to sleep with the big side doors open, and access the galley out of the rain. Both prototypes were given a foam-backed liner on the interior to eliminate the annoyance of interior condensation. Looks nice, too. What if I want to build from scratch? What are the plans like? Plans comprise full-sized patterns for every part in the Teardrop Camper. Spread the patterns out on your plywood sheets, transfer the shapes, and cut them out with a sabersaw. Click here for a complete overview of what plans-building looks like. 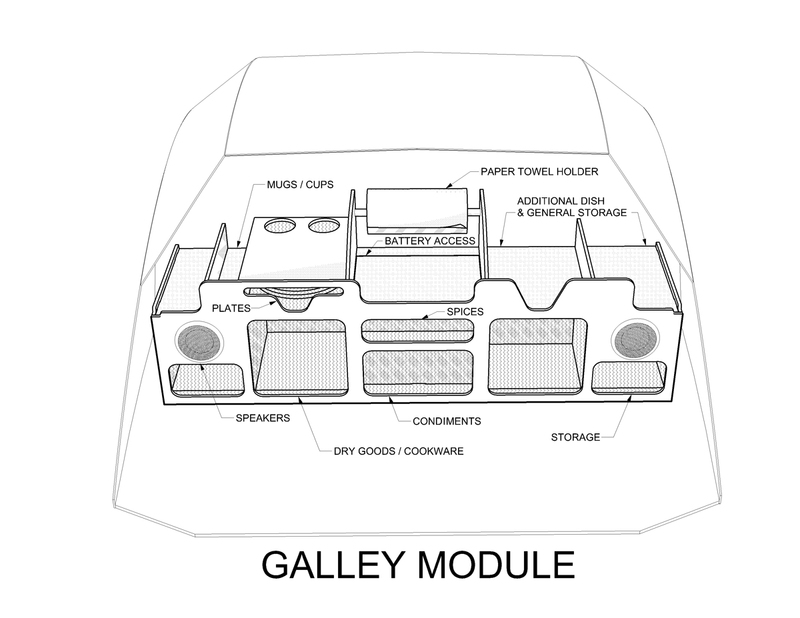 The plans package includes patterns and instructions for options such as the galley module and the storage box. The price is $199 for the full-sized patterns and and manual package. Can I download the plans? Not yet. We might develop a downloadable version of the plans in the future, but for now we'll be mailing tubes with full-sized patterns. I have access to a CNC machine. 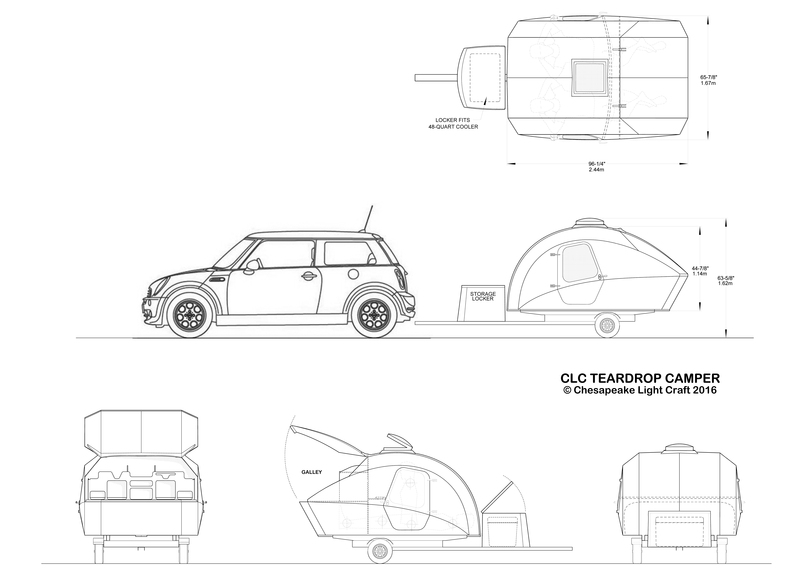 Can you send me the CAD files for the CLC Teardrop Camper? Not until digital-rights management for architectural work catches up to books and music. Yes, we wish it was that easy, too! But in a world swarming with intellectual property thieves, the technology simply isn't ready. Are you working on a larger version of the Teardrop Camper? One that has sit-down seating, a toilet, a bigger galley, berths for eight people, a screening room, and a bowling alley? Not at present, but given sustained interest we would entertain a larger version. If we did a "bigger" teardrop, it would still be quite small, for the simple reason that as the kit gets bigger, you quickly pass a price threshold where a kit ends up costing more than a decent used RV trailer found on CraigsList. Can the CLC Teardrop Camper design be modified so that it's larger? Not easily. From a design perspective it's an intricate, interlocking geometry puzzle. Change one piece of the puzzle and all the other pieces have to be redesigned, too. The CLC Teardrop Trailer is not designed to entice people out of their 20-foot Airstreams, but as a major upgrade from tent-camping. That's the proper frame of reference for this design. Rather than checking off all the things that a big "conventional" RV offers that are missing in a teardrop trailer, note all of the conveniences you're gaining over a tent! Excellent on-the-road gear storage; the ability to be out of the weather and asleep in minutes; no fooling around with ground-cloths and tent stakes; a comparatively plush cooking setup. Couldn't this be turned into a boat somehow? Mounted on floats, or a raft, or something? Google "Shanty Boat" for a far better selection of small floating homes. This is a machine for the highway. Carry your boat on the roof racks. Time lapse coverage of our first build-your-own Teardrop Camper class in Annapolis. 13 days in 13 minutes.